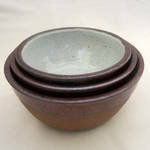 Janelle began taking pottery classes in 2011 at The Clay Studio in San Francisco, CA. When sfclayworks opened later that year, she was thrilled to join this familiar community as part of the “Hands-Up” program. Through this program she has enjoyed learning about mixing glazes, firing kilns, and studio management. This unique learning opportunity has helped Janelle understand and appreciate the process from raw clay to finished piece. She is fascinated with the story of each pot – how every decision along the way leaves its mark on the final piece. Note: Janelle was one of sfclayworks first hands-up assistants from 2012-2013. With new knowledge of glaze materials gained during her hands-up assistantship, Janelle became quite an expert at creating our mystery glazes . We found Janelle to be fearless when given a new task. sfclayworks will always be thankful for her contribution to our success and will miss not having her in the studio.